The overall approach of the report is a descriptive one as it goes into the depth of financial performance of grameenphone limited. Grameenphone limited widely known as GP, is the leading telecommunications service provider in Bangladesh. With more than 29.32 million subscribers (as of December31, 2010). To prepare this analytical report both primary and secondary data were used. Among the sources, data mainly collectedfrom the published annual report of grameenphone and web site of grameenphone. I have constructed this report under five chapters these are given below. The First part, of this report deals with Introduction, objective, methodology, and limitations of the report. In order to understand the financial performance of grameenphone on which the report is carried on. In the Second part, communicate over all Telecommunication industry of Bangladesh and This chapter also tries to show future prospect of telecommunication industry in Bangladesh. which helps to find the current situation of telecommunication industry in SAARC countries and also gives an idea regarding the Current scenario of the mobile phone operator and the market share analysis of the Telco companies exist in Bangladesh. The Third part includes Company profile of Grameenphone. A brief narration of the organizations given on which I selected for my report. These includes Company Facts, business description, object of company, achievements, company structure, product and services of grameenphone and also contribution to national expenditure etc. The Fourth part of the report focuses on the Quantitives analysis and qualitative analysis. Qualitative part describe the SWOT analysis of grameenphone and Quantitives part denotes financial performance of the company. SWOT analysis helps to describe the company’s strength, weakness, opportunity and threat. Financial analysis and ratio analysis part is conducted to know the overall financial situation of recent years of grameenphone. It includes review of annual reports, last five year performance growth, Analysis of financial ratio such as current ratio, quick ratio, account receivable turnover, accounts payable turnover, inventory turnover, debt equity ratio, cost of goods sold, gross profit margin, net profit margin, operating expenses trend, ROA, ROE, Risk analysis, Business growth analysis. The fifth part includes Findings, Recommendation and Conclusion. In this chapter under finding part I have present the remarkable positive sign for the company as well as shortcomings of the company. Under recommendation part I have try to give some suggestion basis on analysis how to manage the loop fall which effects performance of the company. And in the conclusion part I have tried to put gist of my report based on the findings. Grameenphone limited Ltd has passed a long way since it is providing services. Already it has earned Strong market leadership positioned in the filled of revenue generation, market share, ARPU, Profitability, Customer satisfaction etc. hopefully it will continue to hold the position and be perfect in this sector.To keep the leadership position company need to give more and more attention to the customer retention and development. The four year Bachelors of Business Administration program consists of eight semester’s academic program for the building up the theoretical knowledge. This is Consider as the base of practical knowledge. Among 40 courses one course is offer for BBA Internship program for three months is an attempt to provide business graduates an orientation to a real life business situation in which they can observe and evaluate the use and applicability of the theoretical concepts which were taught in the classrooms. The preparation of this report is the primary requirement of the course Project paper submission and viva voice defense. This report “An Overview of the Financial Performance of Grameenphone Limited.” is the outcome of 3 month internship at the Commercial division under the People and Organization Department at the Head Office of Grameenphone Limited. During this time period I was assigned with various types of duties mainly related with the Commercial division. I was under the supervision of Mr. MD Arifur Rahman kandokar, Manager, Commercial division. I have prepared this Internship report with the mentioned topic which was suggested and supervised by my academic supervisor, MS. Irfat Jahan Chowdhury, Lecturer Department of Business Administration, Dhaka City College. To present an overview of the Telecom industry of Bangladesh. To present a background and introduction of Grameenphone Limited. To appraise the financial performance of Grameenphone. Identify the findings of analysis and finding out the problems of Grameenphone. Provide recommendation based on the findings. To build a bridge between theoretical knowledge and practical experience. To get knowledge on Grameenphone Limited and the overall Telcoindustry. To fulfill the requirements of the internship program. The scope of the study is limited within telecommunication business in Bangladesh. It is also limited within the organization of Grameenphone Ltd and especially within in the commercial and finance Division of the company. Here I discuss mostly with the matter related to the topics of the report. For the purpose of the report data and information have been collected from both primary and secondary sources. The relevant information collected from primary sources is collected in an informal way. I have interviewed and taken some suggestions orally from the personnel of Grameenphone Ltd. Besides this, regular conversations with many GP employees have helped me a lot. The secondary sources for data collection are published annual report of Grameenphone Ltd. Information was also taken from books and journals and also from the Internet. The Report was prepared within a very short time considering the topics related to it. That’s why; it was not possible to demonstrate all aspects of the report. It was really difficult for me to accumulate confidential financial data. The annual report for the year 2011 has not been published completely yet. This internship report would be more consistent if I can get the recent year’s information. The data required for sufficient analysis for preparing the report could not be collected due to the insufficiency of data. Data from different sources were quite inconsistent which created some problems in making the report & compelled me to verify the data diligently. Being a student, this type of report preparation was expensive. Bangladesh has one of the lowest teledensity and the lowest telephone penetration rates in the world and even in the South Asia. According to the International Telecommunication Union (ITU) report, the telecommunication revenue as a percentage of the GDP is also low in Bangladesh compared to the other regional countries. Among the SAARC countries per 100 inhabitants Maldives has the highest teledensity while Bangladesh has the lowest. Table 1: Number of telephones per 100 inhabitants in SAARC countries. 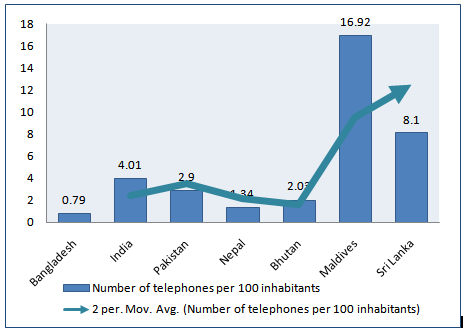 Figure 1: Number of telephones per 100 inhabitants in SAARC countries. From the above diagrams, we can see that Bangladesh has the lowest (0.79) teledensity among the SAARC countries. Maldives has the highest teledensity, which are 16.92. The lowest teledensity of Bangladesh indicates that in Bangladesh there is a huge prospect of the telecommunication industry. More recent data shows that the teledensity of Bangladesh increased significantly as the mobile telecommunication operators performing well in their business. The telecommunication sector in Bangladesh is poised for rapid growth in recent years. The concept of mobile telephony has become largely familiar and phenomenal in Bangladesh from the early 90s. The communication sector particularly mobile phones, is one of the fastest growing areas of the economy. The growth potentials will continue to remain robust for the foreseeable future. The vision of Bangladesh is to establish itself as an ICT-driven nation. Table 2: Telecommunication Indicators in Bangladesh (2006-2010). Bangladesh’s mobile phone market has achieved exceptional growth since the beginning of 2006, registering a massive 100% growth in its subscriber base during 2006, and 137% during 2007. This trend is forecast to continue over the coming years, bringing the subscriber base to 58.2 million by 2010. The recent growth in the Bangladesh mobile market can be attributed to factors such as the deregulation of the telecommunication sector, low levels of teledensity, inadequate fixed phone infrastructure, high competition following the entry of two new operators (Banglalink and Teletalk) and, particularly, massive foreign direct investment (FDI) by telecom giants like Telenor, Telekom Malaysia (TM), Orascom, SingTel, and by India based c Telecom. There are six telephone operators in Bangladesh at the moment. Among them one is Government owned telephone operator: Teletalk Bangladesh Limited and the other five are privately owned companies namely Grameenphone Limited, Robi Axiata (Bangladesh) Limited, Airtel. Oreascom Telecom Bangladesh Limited and Pacific Bangladesh Telecom Limited (PBTL). The huge size of the Bangladeshi population and scarcity of communication have placed Bangladesh as one of the most prolific country for investment in the communication sectors. In many global studies, Bangladesh recently enjoys the status of the fastest growing country and one of the top ten communication investment destinations. Leveraging the above advantages, Five mobile operators have drawn significant foreign investment. From the year 1997 to 2008 Taka 229.56 billion has been invested by the mobile operators. Day by day it is increasing 2009 and 2010. 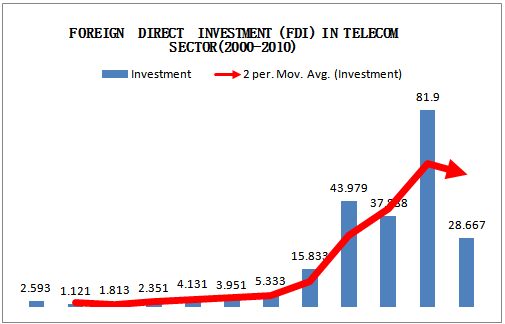 Figure 2: FDI by the Mobile operators in Bangladesh. The telecommunication industry has contributed huge amount of money for the government of Bangladesh. In a study, conducted by Bangladesh Telecommunication Regulatory Commission (BTRC) it has been found that, an increase of 10 mobile phones per 100 people boosts GDP growth by 0.6%. A 1% increase in the number of Internet users increase total exports by 4.3%. Telecom sector contributed approximately 1.46% of national GDP and its significant proportion is contributed by mobile telecommunication sector. The total number of Mobile Phone Subscribers has reached 34.37 million at the end of December 2007. From the table we can see that the total number of Mobile Phone Active Subscribers has reached 44.64 million at the end of December 2008. The total number of Mobile Phone Active Subscribers has reached 52.43 million at the end of December 2009 andthe total number of Mobile Phone Active Subscribers has reached 65.565 million at the end of October 2010.The constant annual growth rate of the mobile phone subscriber is 24.0%. The number of mobile phone subscribers is increasing at very high positive rate. 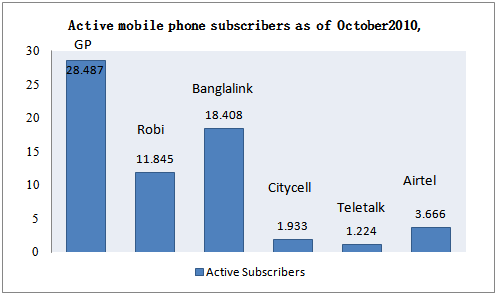 Figure 4: Active mobile phone subscribers as of October, 2010. This is very good for the telecommunication industry. The subscriber growth rate for the mobile service operators is very high. 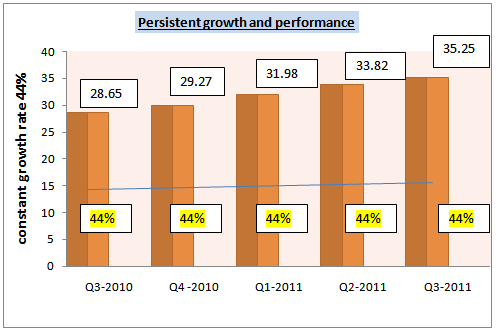 Orascom Telecom Bangladesh Limited (Banglalink) has the highest subscriber growth rate, which is 37.5%, Robi Axiata (Bangladesh) Limited has a growth rate of 22.8% and then Grameenphone Limited is in the third position with a growth rate of 22.4%.Grameenphone has the highest number of subscribers (28.487 million) up to October, 2010. The operator which has the second highest subscriber base is Banglalink and Teletalk has the lowest number of subscriber which is 1.224 million.By assuming the May, 2007 as the base year, it is seen that the market has grown almost 57.69% from May, 2008 to May, 2008, but the market growth fall drastically from May, 2008 to May, 2009 at 10.39% because of imposing a huge tax on SIM. Figure 5: Market growth of the mobile telecommunication industry in last three years. But somehow in the last one year the companies’ give some subsides to make the SIM available at lower price again doubled the market growth. In starting of the analysis of the companies in the telecommunication sector in Bangladesh, first I would like to analysis the current scenario of the market. The current market share of the various mobile phone operators are displayed in the following figure, based on the information provided by the “Bangladesh Telecommunication Regulatory Commission (BTRC)” website. Table 4: Total Market share of the mobile phone operators (As of October 2010). On the above mentioned figure, we found that the total market of the mobile phone is with 65.56 million subscriber where Grameenphone still dominated the market with 43.45% market share which is far higher than its’ follower Banglalink, with 28.08%, and Robi, with 18.07%. The rest of the operator are not in competition with these three operators and hold much low market share compared to them. Figure 6: Distribution of the Market share of the mobile phone operators. But the market share of these companies only 2010 is not sufficient enough to judge these companies. In order to judge the true performance of the organization we should go for analyzing the market share trends of these operators. To best judge the performance of the companies in terms of market share, I choose the data of previous 35 months data on the market share of these companies. 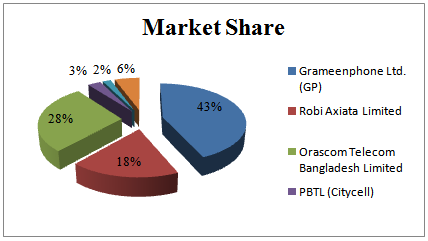 If we analyze the 35 months subscriber’s data for understanding the market share performance of the 6 mobile service operators, the performing operator is the Orascom Telecom Bangladesh Limited with the brand “Banglalink”. If we look at the figure 5, we see that, their market share is constantly increasing from October 2009 to October 2010. Grameenphone Limited is also performing well in their business as they are able to maintain a constant growth rate over the time period. The Axiata (Bangladesh) Limited with the brand “Robi” is also quite successful in obtaining the market share, but there has been some ups and downs in their performance. At present in Bangladesh there are six mobile service operators which provide mobile telecommunication services to the mass people of Bangladesh. Among them one is Government owned telephone operator: Teletalk Bangladesh Limited and the other five are privately owned companies namely Grameenphone Limited, Axiata (Bangladesh) Limited, Airtel Telecom, Oreascom Telecom Bangladesh Limited and Pacific Bangladesh Telecom Limited (PBTL). Robi Axiata Limited is a dynamic and leading countrywide GSM communication solution provider. It is a joint venture company between Axiata Group Berhad, Malaysia and NTT DOCOMO INC, Japan. Robi Axiata Limited, formerly known as Telekom Malaysia International (Bangladesh), commenced its operation in 1997 under the brand name Aktel among the pioneer GSM mobile telecommunications service providers in Bangladesh, the same year when Grameenphone inaugurated its business. The company uses GSM network technology and its brand name was Aktel. At present Axiata Limited have around 235 employees and 11.485 million subscribers. In respect to subscriber base Robi holds the 3rd position in the cell-phone industry. On 28th March, 2010 the company started its new journey with the brand name Robi. Robi Axiata Limited is a Joint Venture company between Axiata Group Berhad (70%) and NTT DOCOMO INC. (30%). NTT DOCOMO INC is the world’s leading mobile communications company and the largest mobile communications company in Japan. DOCOMO serves over 53 million customers, including 44 million people subscribing to FOMA™, launched as the world’s first 3G mobile service based on W-CDMA in 2001. DOCOMO also offers a wide variety of leading-edge mobile multimedia services, including i-mode™, the world’s most popular mobile e-mail/Internet service, used by 48 million people. With the addition of credit-card and other e-wallet functions, DOCOMO mobile phones have become highly versatile tools for daily life. With cutting edge technology and innovative services, DOCOMO is fast becoming a preferred lifestyle choice, continuously expanding its role in its users’ lives, growing globally throughout Asia, Europe and North America. NTT DOCOMO INC is listed on the Tokyo (9437), London (NDCM) and New York (DCM) stock exchanges. The company offers a full array of mobile services for consumers and businesses that are focused on the unique needs of the Bangladeshi community. City cell’s growth strategy is to integrate superior customer service, highest standards of technology and a choice of packages at affordable rates. The company operates a 24-hour call center with well-trained operators to respond to customer queries. City cell’s customer service is open 7 days a week to ensure customers can access Citycell at any convenient time. Citycell (Pacific Bangladesh Telecom Limited) has been converted into a Public Limited Company with effect from 28 March, 2008 in compliance with the notification number SEC/CMRRCD/2006-159/Admin-03/23 of Securities and Exchange Commission (SEC) of Bangladesh. SingTel Asia Pacific Investments Pte Limited. Singapore Telecom Paging Pte Ltd.
Teletalk Bangladesh Limited is a public limited company, registered under the Registrar of the Joint stock companies of Bangladesh. The total shares of the owned by the Government of the People’s Republic of Bangladesh. Though this company is a small player in the overall telecommunication industry of Bangladesh with a market share of only 1.87% (2010), Teletalk continue to grow and engage the customers through their clear commitment to offering high quality products and services as well as leading customer retention and loyalty programmers. Teletalk continues to be a part of the revolution that’s connecting millions of Bangladeshi people and around the world. Teletalk Bangladesh Limited was incorporated on 26 December, 2004 as a public limited company under the Companies Act, 1994 with an authorized capital of Tk.20, 000,000,000 being the only government sponsored mobile telephone Company in the country. On the same day the company obtained Certificate of Commencement of Business from Bangladesh Telecom Regulatory Commission (BTRC). Grameenphone widely known as GP is the leading telecommunications service provider in Bangladesh. With more than 28 million subscribers (as of October 2010), Grameenphone is the largest cellular operator in the country. It is a joint venture enterprise between Telenor and Grameen Telecom Corporation, a non-profit sister concern of the internationally acclaimed microfinance organization and community development bank Grameen Bank. Telenor, the largest telecommunications company in Norway, owns 55.8% shares of Grameenphone; Grameen Telecom owns 34.2% and the remaining 10% is publicly held. Orascom Telecom Bangladesh Limited (Banglalink) is a 100% owned subsidiary of Orascom Telecom Holding S.A.E., Egypt, in Bangladesh. It was acquired by Orascom Telecom Holding in 2004, and after a complete overhaul and the deployment of a new GSM network, its telecommunication services were re-launched under the brand name “Banglalink”. 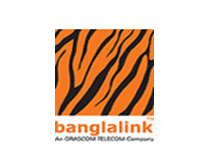 When Banglalink began operations in Bangladesh in February 2005, its impact was felt immediately Overnight mobile telephony became an affordable option for customers across a wide range of Market segments. Banglalink’s success was based on a simple mission: “bringing mobile telephony to the masses” which was the cornerstone of its strategy. Banglalink changed the mobile phone status from luxury to a necessity and brought mobile telephone to the general people of Bangladesh and made a place in their hearts. The mobile phone has become the symbol for the positive change in Bangladesh. This positive change that is quite correctly attributed to Banglalink has become the corporate positioning of Banglalink and is translated in their slogan “making a difference” or “din bodol”. “Making a difference” not only in the telecom industry, but also through its products and services, to the lives of its customers. This corporate attitude of “making a difference” has been reflected in everything Banglalink does. Banglalink attained 1 million subscribers by December 2005 and 3 million subscribers in October 2006. In less than two years which is by December 2007, Banglalink overtook Aktel to become the second largest operator in Bangladesh with more than 7.1 million customers. Banglalink currently has 14.22 million subscribers as of march 2010, representing a market share of 26%. Grameenphone is the largest mobile telecommunications operator in Bangladesh in terms of revenue, coverage and subscriber base. The company was incorporated on October 10, 1996 as a private limited company. Grameenphone converted to a public limited company on June 25, 2007. Trading of the company’s shares started at Dhaka and Chittagong Stock Exchanges from 16 Nov. 2009. The shareholding structure comprises of mainly two sponsor Shareholders namely Telenor Mobile Communications AS (55.80%) and Grameen Telecom (34.20%). The rest 10.00% shareholding includes General public & other Institutions. Some related information regarding company. Figure 12: Network coverage of GP. 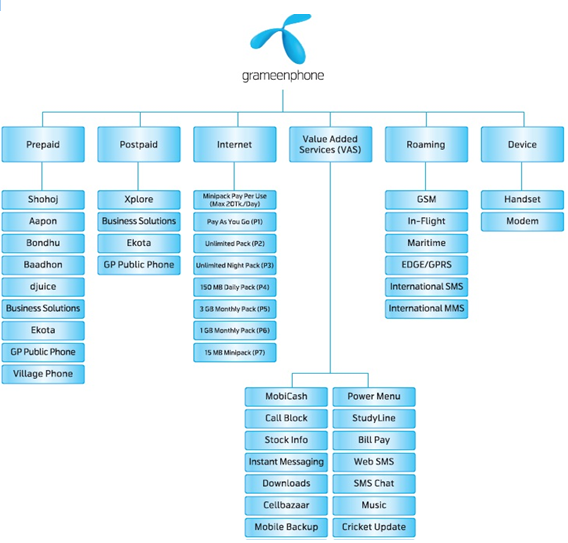 – Grameenphone has a fully owned subsidiary named Grameenphone IT Ltd.
Grameenphone operates a digital mobile telecommunications network based on the GSM standard in the 900 MHz and1800 MHz frequency bands, under a license granted by the Bangladesh Telecom Regulatory Commission (BTRC). As per the terms of the “Licensing Agreement” with Ministry of Posts and Telecommunications, (succeeded by Bangladesh Telecom Regulatory Commission), the radio system operating license of Grameenphone was expire on 11 November 2011. The license is, however, subject to renewal upon fulfillment of certain terms and conditions. Management foresees no uncertainty regarding renewal of this license. Grameenphone serves both rural and urban customers across Bangladesh, where mobile telephony is a major driver of socioeconomic development. Bangladesh has one of the lowest teledensity rates and highest subscriber growth rates in the world. Grameenphone built its network on a nationwide basis. As of December 2010, Grameenphone’s network covered 99% of Bangladesh’s population and 89% of the total land area, and the network infrastructure included more than 14,000 base stations located in about 7,200 sites in operation around the country. Grameenphone network is EDGE/GPRS enabled, allowing our customers to gain access to high-speed Internet and data services from anywhere within the coverage area. Grameenphone has been a market leader in introducing new products and services in Bangladesh. The company was one of the first mobile phone operators to launch GSM service in the country. Grameenphone was also one of the first operators in Bangladesh to offer the subscribers mobile to mobile service, EDGE, prepaid service, voice SMS and “over-the-air” top-ups. In January 2008, Grameenphone became the first mobile operator in Bangladesh to offer Blackberry TM services. The company has so far invested more than BDT 15,260 crore to build the network infrastructure since its inception in 1997. Grameenphone is one of the largest taxpayers in the country, having contributed more than BDT 16,600 crore in direct and indirect taxes to the Government Exchequer over the years. Since its inception in March 1997, Grameenphone has built the largest cellular network in the country with over 14,000 base stations in more than 6,000 locations. Grameenphone was also the first operator to introduce the pre-paid service in September 1999. It established the first 24-hour Call Center, introduced value-added services such as VMS, SMS, fax and data transmission services, international roaming service, WAP, SMS-based push-pull services, EDGE, personal ring back tone and many other products and services. Grameenphone nearly doubled its subscriber base during the initial years while the growth was much faster during the later years. It ended the inaugural year with 18,000 customers; 30,000 by the end of 1998; 60,000 in 1999; 193,000 in 2000; 471,000 in 2001; 775,000 in 2002; 1.16 million in 2003; 2.4 million in 2004; 5.5 million in 2005; 11.3 million in 2006; 16.5 million in 2007; 20 million in 2008 and in the end of 2009 with 23.26 million customers and 2010 it almost reach 3 million customers to its base. From the very beginning, Grameenphone placed emphasis on providing good after-sales services. In recent years, the focus has been to provide after-sales within a short distance from where the customers live. There are now more than 400 GP Customer Service touch point and 1000 STP across the country covering nearly all Upazila of 67 districts. In addition, there are 82 Grameenphone Centers in all the divisional cities and they remain open from 09am-7pm every day including all holidays. GP has generated direct and indirect employment for a large number of people over the years. The company presently has more than 4600 full and temporary employees. Another 150,000 people are directly dependent on Grameenphone for their livelihood, working for the Grameenphone dealers, retailers, scratch card outlets, suppliers, vendors, contractors and others. In addition, the Village Phone Program, also started in 1997, provides a good income-earning opportunity to more than 210,000 mostly women Village Phone operators living in rural areas. The Village Phone Program is a unique initiative to provide universal access to telecommunications service in remote, rural areas. Administered by Grameen Telecom Corporation, it enables rural people who normally cannot afford to own a telephone to avail the service while providing the VP operators an opportunity to earn a living. Grameenphone considers its employees to be one of its most important assets. GP has an extensive employee benefit scheme in place including Gratuity, Provident Fund, Group Insurance, Family Health Insurance, Transportation Facility, Day Care Centre, Children’s Education Support, and Higher Education Support for employees, in-house medical support and other initiatives. We exist to help our customers get the full benefit of communications services in their daily lives. We want to make it easy for customers to get what they want, when they want it. Grameenphone’s renewed Vision recognizes that we exist to help our customers get the full benefit of communications services in their daily lives. The key to achieving this is that we work together and draw on our renewed Values and build them into guiding light behaviors in our workplace, wherever that may be… Make it easy. Keep promises. Be inspiring. Be respectful. As of December 31, 2011, Grameenphone is the largest mobile operator in Bangladesh by subscribers’ base, with 30 million subscribers and a subscriber market share of 47.0%. The company believes that their leading position has helped them develop strong brand recognition and a high profile among existing and potential subscribers. In addition, Grameenphone’s critical mass has allowed it to realize significant benefits from economies of scale in many aspects of our operations, such as equipment procurement, sales and marketing, billing and customer service. Grameenphone also believe that being one of the original GSM mobile cellular licenses in Bangladesh allowed it to access to early subscribers for mobile telecommunications, whom they believe tend to be more affluent and have greater resources to spend on telecommunications. Grameenphone derived significant benefits from its shareholders’ commitment to their business, including Telenor’s experience in deploying mobile networks and business operations across multiple emerging markets. They have also benefited from Telenor’s existing relationship with financing sources, industry vendors and suppliers. Grameen Telecom understands of the Bangladesh market, its leadership in developing the Village Phone Program and its contribution of the “Grameen” brand has also supported Grameenphone’s business growth over the years. Grameenphone has a strong nationwide distribution network with approximately 110,000 points-of-presence (including approximately 14,000 retail outlets) throughout Bangladesh’s 67 districts where the subscribers can purchase the services. GP has established more than 82 branded retail stores, known as Grameenphone Centers, which offer a range of mobile telecommunications service, SIM cards, top-up cards, mobile handsets and accessories as well as customer service. GP also operate a 24-hour call center to provide customer support. GP has consistently sought to develop and market innovative products and services to meet their subscribers’ needs, and they believe their innovation allows them to attract and retain subscribers. GP was one of the first companies in Bangladesh to offer their subscribers mobile to mobile services, GSM, EDGE, prepaid service, voice SMS and “over-the-air” top-ups. In addition, in January 2008, it became the first mobile operator in Bangladesh to offer Blackberry TM services. GP’s network is EDGE/GPRS enabled, allowing their customers to gain access to high-speed Internet and data services from anywhere within their coverage area. During the three months ended December 31, 2010, approximately 4.2 million of GP subscriber browsed the internet via their handsets, making GP one of the largest providers of Internet access in the country. A highly experienced management team leads the development of Grameenphone business, products and services. GP management team includes senior executives who have working in Bangladesh since the commercialization of GSM mobile telecommunications services in Bangladesh in 1997. In addition, members of GP management team and its Board of Directors have operational experience in other emerging and developed telecommunications markets, including as managers within Telenor and its subsidiaries (The Telenor group). Grameenphone has a dual purpose to receive an economic return on its investments and to contribute to the economic development of Bangladesh where telecommunications can play a critical role. This is why Grameenphone, in collaboration with Grameen Bank and Grameen Telecom, is aiming to place one phone in each village to contribute significantly to the economic benefit of the poor. Grameenphone’s strategy is coverage of both urban and rural areas. In contract to the “island” strategy followed by some companies, which involves connecting isolated islands of urban coverage through transmission links, Grameenphone builds continuous coverage, cell after cell. While the intensity of coverage may vary from area to area depending on market conditions, the basic strategy of cell-to-cell coverage is applied throughout Grameenphone’s network. The people who are making it happen-the employees are young, dedicated and energetic. All of them are well educated at home or abroad, with both sexes (gender) and minority groups in Bangladesh being well represented. They know win their in hearts that Grameenphone is more than phones. This sense of purpose gives them the dedication and the drive, production-in about eight years-the biggest coverage and subscriber-base in the country. Grameenphone knows that the talents and energy of its employees are critical to its operation and treats them accordingly. Grameenphone’s Global System for Mobile Telecommunication or GSM technology is the most widely accepted digital system in the world, currently used by over 900 million people in 150 countries. GSM brings the most advanced development in cellular technology at a reasonable cost by spurring severe competition among manufactures and driving down the cost of equipment. Thus consumers get the best for the least. Grameenphone’s believes in service, a service that leads to good business and good development. Telephony helps people work together, raising their productivity. This gain in productivity is development, which in turn enables them to afford a telephone service, generating a good business. Thus development and business go together. Grameenphone wants to maintain the lead and to overtake the competitors in the country and this is what Grameenphone has been dedicated to seeking. It wants to provide all its employees with challenging and rewarding work, satisfying working conditions, and opportunities for personal development, advancement, and competitive compensation. It wants to capture bigger market share. It wants to achieve low operating costs. It wants to offer broader and more attractive products for the customers. It wants to enhance the satisfaction of its consumers by providing quality and superior service. Grameenphone Limited wants to earn growth in revenues and earnings. It wants to earn wider profit margin. It wants to realize higher return on invested capital. GP believes it can continue to grow its subscriber base, while seeking to limit declines in Average Price per Minute (APPM), by increasing the availability of its products and services throughout Bangladesh and by aiming to improve customer retention. GP believes that new subscribers will be attracted by its network coverage and its broad offering of services, as well as its service quality and the strength of the brand. In the near term, market conditions have led GP to increase the prices of its starter packs and, as a result, GP will be focused on higher value customers. In the longer term, GP expects to increase its penetration of the growing consumer, rural and financially constrained market sectors. GP experienced growth in the consumer, rural and financially constrained market sectors during the year ended December 31, 2010. GP strives to provide superior network coverage, connectivity, quality and reliability, as well as to continue its product and service innovation through continued investment in its network and products. GP believes that being an incumbent mobile operator has allowed GP to attract early subscribers, whom it believes tend to be more affluent and have greater resources to spend on telecommunications. GP intend to continue focusing on this high value customer segment, which GP expects will grow as the Bangladesh population becomes more affluent, with its value added services, in particular Internet access and Blackberry TM. GP also intends to increase its focus on the high value business segment customers, given the high usage of its voice and non-voice services by these customers. GP plans to continue exercise strong discipline over its operating costs and capital expenditures to achieve improved efficiency and productivity in its operation and leverage its existing capacity. Historically the majority of GP’s capital expenditures were undertaken to support the geographic expansion of its network to achieve targeted population coverage of more than 99.0% of Bangladesh. Having achieved that target in 2007, GP is now focusing its ongoing capital expenditures on expansion of its overall capacity to accommodate increases in subscribers and traffic. In 2011, GP moved from a single vendor framework to a dual vendor framework as it entered into a long-term purchase and maintenance agreement for the purchase and maintenance for network and radio access equipment with Huawei Technologies Co. Ltd., and it plans to renew its framework agreement for the purchase and maintenance of GSM equipment with Ericsson AB. GP believes that the use of multiple principal suppliers will provide pricing advantages for GP’s future capital expenditure. GP has built its own fiber optic network to provide greater redundancy in its network services. GP also plans to reduce its operation and maintenance expenses by, among other things, using solar power, controlling service agreement pricing and lobbying to reduce the SIM tax. GP intends to support its brands by undertaking brand refreshment exercises from time to time. In April 2008, GP launched the “Stay Close” campaign, which helps GP to reinforce its branding by emphasizing the importance of staying close to friends and family. GP believes the campaign has been successful in increasing brand awareness. For its consumer segment, GP has positioned itself as being its customers’ lifestyle partner, giving them access to services which enhance their lives. For its business segment, it has positioned itself as being the customers’ partner in business, providing efficient and relevant services. For the youth segment, GP has the “djuice” brand, which it supports by focusing on text messaging, music, and community service. GP’s revenues from non-voice services as a percentage of Average Revenue per User (ARPU) were 4.2% for the year ended December 31, 2010, which proportion remains low relative to operators in comparable markets in Asia and hence providers scope for non-voice revenue growth. GP offers a wide range of non-voice services, including SMS, MMS, games, information services, content download, ring back tones, internet access and Blackberry TM services. GP plans to continue increase its revenue from non-voice services by actively promoting these services, developing additional services and further expanding its presence as one of the largest providers of Internet access in Bangladesh. GP has adopted its distribution model to the changing telecommunications market in Bangladesh. In the first half of 2010, GP implemented a new distribution model. Prior to 2008, GP relied on pull model, whereby its dealers contacted GP with product orders. GP’s new distribution model is to push sales to retailers by distributing its SIM cards, electronic recharge system (ERS) and scratch cards through a network of nearly 100 third-party distributors. These distributors distribute GP’s products to retailers, who then sell the products to the public. GP has targeted to have approximately 20,000 retailers in its distribution network selling new connections and 110,000 retailers for reload. GP’s objectives under the new distribution model are to improve its product availability throughout the country with the establishment of more points of sale, improve inventory management, accelerate distribution of its products, provide better support to its customer base, create a strong channel of communication between, GP and its subscribers and obtain better market data to allow GP to be more dynamic and responsive to the market. By bringing electronic connectivity to rural Bangladesh Grameenphone is bringing the digital revolution to the doorsteps of the poor and unconnected. By being able to connect to urban areas or even to foreign countries, a completely New World of opportunities is opening up for the people in Bangladesh. Grameenphone Limited completed its thirteenth year of operation and crossed the 30 million-subscribers mark in 2011. It is a remarkable achievement indeed. The GP launched its product on March 26, 1997. In July 2001, Grameenphone was identified by EMC, the London-based mobile phone market research firm, as the fastest growing and single- largest mobile phone company in the South Asian region. The mobile phone sector of the country has also matured during this period. In fact, mobile phone users now outnumber the fixed-line telephone subscribers in the country. The Village Phone Program is another innovative GP initiative launched in collaboration with Grameen Telecom, a shareholder of the company. Introduced in 1997, this unique service provides telecommunication services in remote rural areas where no such facilities existed before. Moreover, it also provides an income generating opportunity for the Phone operators, mostly rural poor women. The village Phone Program won the GSM in the Community Award given at the GSM World Congress held in Cannes, France in February 2000. Grameenphone is the largest telecommunications service providers of Bangladesh. Market share in terms of subscribers: 44%. Workforce: more than 4,637 employees (DEC, 2010). Total number of subscribers: 29.97(Dec, 2010). 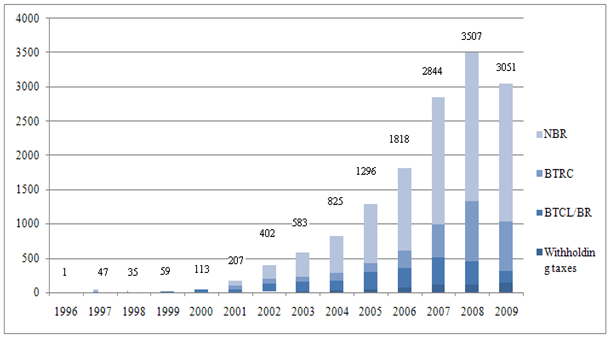 BDT 74.73 billion revenues for 2010 which is 12.62% higher than 2009. Listed at Dhaka Stock Exchange and Chittagong Stock Exchange. Rated AAA for long term loan and ST-1 for short term loan. The largest Corporate Tax payer in Bangladesh. Grameenphone has a fully owned subsidiary named Grameenphone IT Ltd.
Headquarter in Bashundhara Residential Area, Dhaka, Bangladesh. Grameenphone offered the largest Initial Public Offering (IPO) in the history of Bangladesh Capital Market. Grameenphone received the GSM in the Community Award, the Best Joint Venture Enterprise of the Year at the Bangladesh Business Awards, the GSM Association’s Global Mobile Award. 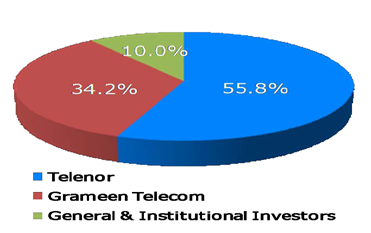 As of 31 December 2010holding structure comprises of mainly two sponsor Shareholders namely Telenor Mobile Communications (55.80%) and Grameen Telecom (34.20%). The rest 10.00% shareholding includes General public & other Institutions. Telenor Mobile Communications (TMC), a company organized under the laws of the Kingdom of Norway, seeks to develop and invest in telecommunications solutions through direct and indirect ownership of companies and to enter into national and international alliances relating to telecommunications. It is a subsidiary of Telenor Mobile Holdings AS and an affiliate of Telenor. Telenor AS is the leading Telecommunications Company of Norway listed on the Oslo Stock Exchange. It owns 55.80% shares of Grameenphone Ltd. Telenor’s strong international expansion in recent years has been based on leading-edge expertise, acquired in the Norwegian and Nordic markets, which are among the most highly developed technology markets in the world. It has substantial International operations in mobile telephony, satellite operations and pay Television services. In addition to Norway and Bangladesh, Telenor owns mobile telephony companies in Sweden, Denmark, Hungary, Russia, Ukraine, Serbia, Montenegro, Thailand, Malaysia, Pakistan and India with more than 174 million mobile subscriptions worldwide as of December 31, 2010. Telenor uses the expertise it has gained in its home and international markets for the development of emerging markets like Bangladesh. As part of the conversion of Grameenphone from a private limited to a public limited company, Telenor Mobile Communications AS transferred 10 shares each on May 31, 2007 to its three affiliate organizations namely Nye Telenor Mobile Communications II AS, Norway; Telenor Asia Pte. Ltd. Singapore and Nye Telenor Mobile Communications III As, Norway. Grameen Telecom, which owns 34.20% of the shares of Grameenphone, is a not-for-profit company in Bangladesh, working in close collaboration with Grameen Bank, winner of the Nobel Peace Prize for 2006 along with its founder Professor Muhammad Yunus. The internationally reputed bank for the poor has the most extensive rural banking network and expertise in microfinance. It understands the economic needs of the rural population, in particular the women from the poorest households. GTC’s mandate is to provide easy access to GSM cellular services in rural Bangladesh and creating new opportunities for income generation through self- employment by providing villagers, mostly to the poor rural women with access to modern information and communication-based technologies. GTC is also one of the three National distributors of Nokia brand handsets in Bangladesh and also the authorized service provider of Nokia Care network, providing after sales services to the Nokia customers. With the help of Grameen Bank, Grameen Telecom, with its field network, administers the Village Phone Program, through which Grameenphone provides its services to the fast growing rural customers. Grameen Telecom trains the operators, supplies them with handsets and handles all service-related issues. GTC has been acclaimed for the innovative Village Phone Program. GTC & its chairman Nobel peace prize laureate Professor Muhammad Yunus have received several awards which include: First ITU World information Society Award in 2005; Petersburg Prize for Use of the IT to improve Poor People’s Lives” in 2004; GSM Association Award for “GSM in Community Service” in 2000. As part of the conversion of Grameenphone from a private limited to a public limited company, Grameen Telecom transferred one share each on May 31, 2007 to its two affiliate organizations namely Grameen Kalyan and Grameen Shakti. This analysis is based on the subscribers’ numbers from December 2007 to October 2010. The growth trend of the number of subscribers of Grameenphone Ltd. is a unique example in the telecommunication field in Bangladesh. The total number of GP subscribers is 35.20 million till Oct 2011. Source: Investor portal of grameenphone. Figure 8: Source- investor portal of grameenphone. Telephone sector is a service-oriented sector. Grameenphone offered various types of new and innovative telephone services to both the urban and rural people of Bangladesh during the last six years. The GP-GP or mobile-to-mobile service, the EASY pre-paid service, the village phone program are among its largest innovations. Besides these largest ones Grameenphone also introduced a number of value added services like the news update service, international roaming facility, Voice Mail Service, Text Mail Service, fax and data transmission services, Wireless Application Protocol (WAP) service etc. The company is the pioneer in most of its services. Handsets or the phone-sets and the SIM-Cards are the only physical products provided by the company. Grameenphone was able to reach telephones in many remote areas of the country and also connect those areas with the far foreign countries. At present GP offer more the 10 types of prepaid packages and a postpaid package. With the regular cell phone services it also offer seven (10) types of internet packages at different prices for its’ prepaid and postpaid users. Along with internet and mobile communication GP offers twenty four (24) different types of Value Added Services (VAS) to the customers. GP also offer eight (8) types of roaming facilities. It also diversify its’ business in selling of internet (EDGE) modem and handset of its’ own brand. So in total GP provide 41 different product and services to the consumers. The village phone program is another innovative GP initiative launched in collaboration with Grameen Telecom, a sister concern of Grameen Bank, which provides micro-credit only to the rural poor. GP utilizes Grameen Bank borrowers to retail telecom services in the rural areas. Leveraging on Grameen Bank borrowers reduces the distribution costs of Grameenphone’s rural services, contributing to the profitability of this segment. Introduced in 1997, this unique service provides telecommunication services in remote rural areas where no such facilities existed before. Moreover, it also provides an opportunity for the village phone operators as they can utilize GP mobiles with a subsidized rate (half of the original rate) and can be engaged in a business with mobile phones. In this way GP helps the poor villagers through generating a source of income. The average bill of the village phone subscribers was Tk.5000 as of June 2002. Therefore, village phone is a great help for the village people, especially the poor village women.From the inception phase, village phone program is facing a continuous growth trend. As of December 2002, there are more than 23000 village phones in operation around the country, spread over 21500 villages in 335 Upazila of 50 districts. The village phones in operations presently provide access to telecommunication facilities to some 40 million people in remote, rural areas. The village phone program was given the “GSM in the Community Award” by the GSM Association at the GSM Congress in Cannes, France in February 2000. It also received the Commonwealth Association for Public Administration and Management Bronze Award for community service in 1998. Two research studies have found that the introduction of village phones has made a tremendous social and economic impact in the rural areas among the rural people. One of the studies was jointly conducted by Jahangirnagar University and the Center for Development Research at the University of Bonn in Germany. The other study was conducted by the Telecom Mons Development Group (TDG) of Canada for the Canadian International Development Agency. Community Information Center (CIC) or GPCIC is aimed at providing internet access and other communications services to rural areas. In February 2006, 26 CICs were established across the country as a pilot project. In this project, Grameenphone provides GSM/EDGE/GPRS infrastructure and technical support and other partners Grameen Telecom Corporation and Society for Economic and Basic Advancement (SEBA), are involved in selecting and training entrepreneurs to run the village centers. The computers in these centers in the pilot project are used by an average of 30 people a day, who pay a small fee to access email or Web pages. These CICs are used for a wide variety of business and personal purposes, from accessing health and agricultural information to using government services to video conferencing with relatives overseas. Grameenphone also trains the entrepreneurs so that they can give people advice on how to set up an e-mail account and best make use of the Internet. CIC project is giving up to 20 million people the chance to use the Internet and e-mail for the first time. Following a successful pilot project, Grameenphone is going to set up approximately 560 centers in communities throughout Bangladesh by the end of 2006. The centers will be located in each Upazila (sub-district) of Bangladesh. As a result, up to 15 villages containing up to 40,000 people will be within reach of each CIC. In this information center, there will be personal computers connected to Grameenphone’s existing GSM mobile network, which has been upgraded with EDGE technology to offer data transfer speeds of up to 16 kilobytes per second. A Grameenphone center (GPC) serves as a “one stop solution” for customers, with all telecommunications products and services, under a single roof. A Grameenphone center also sells phones from vendors like Nokia, Samsung, Motorola, Sagem and Benq. EDGE/GPRS modems and accessories such chargers and headphones are also sold at GPCs. As of Dec, 2011, there are 82GPCs and they are strategically located at all major locations of the country is operated by Grameenphone. As of today most of the newly opened GPC’s are franchised. Most of these franchised outlets are in non-metropolitan areas .The GPCs also provide the Flexiload service without charging extra for small denominations unlike many retailers in the country. Thus making the GPC’s an ideal place for many for such a service. Every once a while, the GPCs tie up with handset manufactures and start a nationwide marketing scheme by selling the specific vendors’ products at a price lower than the market’s or in bundle with a Grameenphone connection loaded with free minutes. A news update service was introduced in 2001 in cooperation with two leading national newspapers of the country. The GP subscribers can now get a two-minute update of the latest news. Another latest addition of GP is the Push-Pull service that provides phone numbers of many important things like taxi, hospitals etc. The subscribers of GP regular service can use their mobile phones in many foreign countries with the international roaming facility. Grameen Phone has international roaming agreements with more than 137 mobile phone operators in 51 countries whose subscribers can also use their mobile phones when they are in Bangladesh. An automated telephone inquiry service was introduced in 2001. The system is known as INSTA-CARE. It has an Interactive Voice Response (IVR) mechanism to handle calls from the subscribers in a systematic way, reducing the waiting period. It is operative round-the-clock. This service provides information in both Bengali and English concerning different customers’ queries about GP services like monthly bills, coverage area, sales package etc. Grameenphone provides services to aid the sports sector and help the sports lovers. It announced the latest scores of the Asian Cricket Cup held in Dhaka and the Cricket World Cup held in South Africa. Having a lot of sport spirit, Grameenphone actively participated for the development of cricket in the country, especially for the youth development program of cricket. Grameenphone sees itself as the “fanatic” of Bangladesh National Cricket Team. Recently GP entered into an agreement to sponsor the Premier Cricket League for the next three years starting this year. Grameenphone is also the sponsor of the Special Olympic Team of Bangladesh. 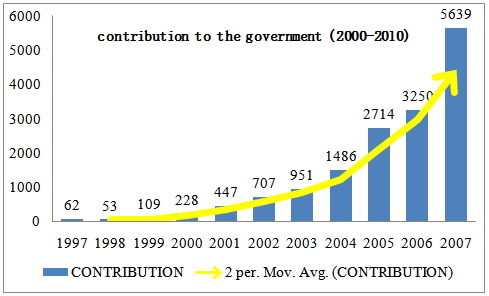 The collective contribution to the National Exchequer from inception up to December 2009 was BDT 147.9 billion (BDT 14,790 crore), of which, BDT 30.5 billion (BDT 3,050 crore) was made in 2009 alone. Out of total BDT 147.9 billion (BDT 14,790 crore), BDT 122.2 billion (BDT 12,220 crore) was made on account of direct tax, VAT and duties through National Board of Revenue (NBR) and Bangladesh Telecommunication Regulatory Commission (BTRC), BDT 20.1 billion (BDT 2,015 crore) through commercial agreements with Bangladesh Railway (BR) and Bangladesh Telecommunications Company Limited (BTCL) and BDT 5.5 billion (BDT 550 crore) as indirect payments on account of local and foreign staff income taxes and withholding taxes on operating expenditure payments. Grameenphone has been the largest corporate taxpayer in the country for the last four years. Grameenphone has also generated direct and indirect employment for a large number of people over the years. The company presently has about 4,800 employees while 150,000 people are directly dependent on Grameenphone for their livelihood, working for the dealers, retailers, electronic reload and scratch card retail outlets, suppliers, vendors, contractors and other business partners. With the payment of taxes and the investment in the network, Grameenphone is making a significant contribution to the country’s development and growth. Source: BTRC Annual Report 2010. Figure 10: Contribution to National Exchequer. Grameenphone built its network on a nationwide basis. As of Dec 2010, Grameenphone’s network covered 99.0% of Bangladesh’s population and 88.84% of the total land area, and the network infrastructure included around 114,000 TRXs in more than 12000 base stations. Grameenphone aims to build a full range of service all over the country. The company has targeted to build extensive network all over the country. For better coverage, GP has taken 1600 Km fiber optic cable network leased from Bangladesh Railway. In April 2004, GP had 750 base stations. As of Dec 2010, it has 12000 base stations in more than 6000 location. Furthermore, considering the subscribers’ need of quality network and extensive coverage, the company is planning to set up another thousand base stations in the following year. Already the company has expanded its network to 67 districts out of 67 districts and almost all upazillas. 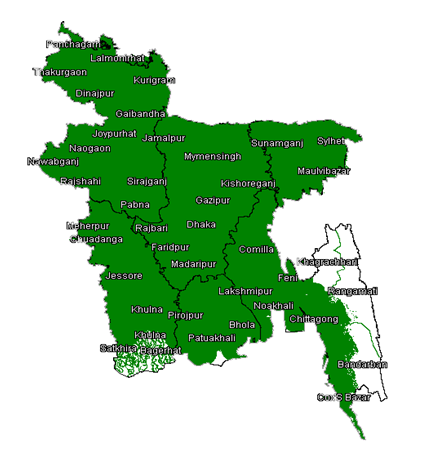 In 2011,it also expanded its coverage to Chittagong Hill Tracts area. It’s the only company which covers the most of the land areas with its network. As of Dec 2010, approximately 88.84% of the country’s total land area and 99% of the country’s population is covered by Grameenphone’s network. In over all, Grameenphone offers the most competitive network facility to its subscribers, and continue improving it. Existing coverage areas are divided into six zones according to the divisional boundary. As the figure shows (green meaning network coverage), Grameenphone has almost continuous coverage throughout Bangladesh, apart from the hill districts of Chittagong and some patches of Sunderbans. In the fast-paced and versatile world of telecommunications, vibrant and dynamic Corporate Governance practices are essential ingredient to success. 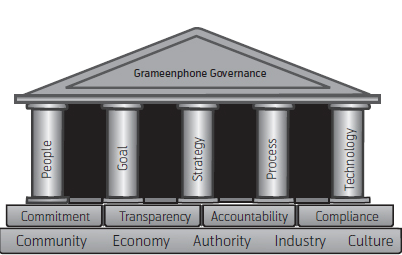 Grameenphone believes in continued nurturing and improvement of corporate governance. This in turn has led the Company to commit considerable resources and implement internationally accepted Corporate Standards in its day-to-day operations. Being a public limited company, the Board of Directors of Grameenphone has a pivotal role to play in meeting stakeholders’ interests. The Board of Directors and the Management Team of Grameenphone are committed to maintaining effective Corporate Governance through a culture of accountability, transparency, well-understood policies and procedures. The Board of Directors and the Management Team also Endeavour to maintain compliance of all laws of Bangladesh and all internally documented regulations, policies and procedures. Grameenphone is a transparent company and maintains highest level of integrity and accountability practiced on a global standard. The Directors of the Board are appointed by the Shareholders at the Annual General Meeting (AGM) and are accountable to the Shareholders. The Board is responsible for guiding the Company towards accomplishment of the goals set by the Shareholders. The Board also ensures that Grameenphone Policies & Procedures and Codes of Conduct are implemented and maintained; and the Company adheres to generally accepted principles for good governance and effective control of Company activities. In addition to other legal guidelines, the Grameenphone Board has also adopted Governance Guidelines for the Board for ensuring better governance in the work and the administration of the Board. The Board in Grameenphone is comprised of nine Directors, including the Chairman who is elected from amongst the members. In compliance with the Corporate Governance Guidelines issued by the Securities and Exchange Commission (SEC) and as per provision of the Articles of Association (AoA) of the Company. The AoA of the Company requires the Board to meet at least four times a year or more when duly called for in writing by a Board member. Dates for Board Meetings in the ensuing year are decided in advance and notice of each Board Meeting is served in writing well in advance. The roles of the Board and Chief Executive Officer are separate and delineation of responsibilities is clearly established, set out in writing and agreed by the Board to ensure transparency and better corporate governance. To that end, GP has also adopted “Governance Guidelines for Chief Executive Officer”. The CEO is the authoritative head for day-to-day management in GP. He acts to reasonably ensure that GP develops and conducts business as per the Articles of Association, decisions made by the Board and shareholder, as well as according to Grameenphone Policies and Procedures, and applicable regulatory legislations.